All transactions are safe and secure with a reliable history in online purchasing behind each of our associates. Buy the Kazakhstani Princess t-shirt to own Borat clothing and merchandise. Let everyone know that you're a Princess back in Borat's home country of Kazakhstan. These Borat t-shirts feature the phrase, "Kazakhstani Princess," written in pink text with a pink crown above the text. 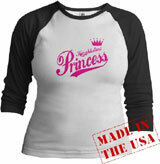 The pink design is also available on short sleeve tees, sweatshirts, tank tops, and babydoll Ts. The Jr. Raglan tee shown on the left is from American Apparel. It is made of superfine baby rib cotton. In addition to the Kazakhstani Princess tee above, browse the Borat Clothing Gallery for more apparel like men's and women's clothes, kids shirts or hoodies.